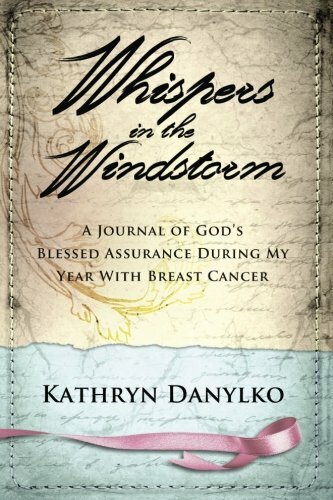 In “Whispers in the Windstorm,” Kathryn Danylko takes us along on her journey through breast cancer. As she tells her story, she also shares how she feels that God “whispered” to her through her writings. She began journaling by writing in spiral notebooks. Upon completion, she condensed 700 typed pages into 366 pages. Her journals cover from December 2010, when she got her diagnosis, to November 2011, after she completed her chemo. She was very open about her diagnosis, which allowed people who cared about her to step in and help. Throughout her story, Kathryn is surrounded by her family, people from her church, and friends. She was also blessed with other amazing people who came into her life at the perfect time. This includes medical professionals who had overcome breast cancer. The diagnosis did not stop Kathryn from continuing with her plans to go on a missionary trip to Haiti. It had already been planned and she was still waiting to find out when she would have surgery. Her whole life has been about helping others, and she was not going to give up the promise that she made when she volunteered to lead this mission. Her Ukrainian Pentecostal Church plays a huge role in helping Kathryn and her family get through this ordeal. Kathryn did not have the typical symptoms usually seen with breast cancer. Initially, she thought that she would just need a lumpectomy and then possibly radiation. However, when she discovered that she had an aggressive form of breast cancer she ended up with a mastectomy and chemotherapy. If she did not have the chemo, she would risk a 30% chance of it returning to somewhere else in her body like her brain or her bones. The thought of her children outliving her was terrifying, so she took the best route for recovery. Throughout all of this, and having to deal with the emotions involved, she never once let go of her faith. She was very open about her fears, including those of not surviving surgery, dying from cancer, and even the thoughts of feeling that her body was going to be mutilated. While reading this inspiring journal, I immediately thought of all the people who could benefit from reading this, including women with cancer, caregivers, loved ones, and medical professionals. Her words will let people know that they are not alone. There is also another important part of Kathryn’s story that comes through her words; I feel that this experience also gave her a chance to share her work with helping others, especially those who have nothing. Being faced with a possibly fatal illness, and doing her missionary work allows Kathryn to remind us that we need to focus on what is truly important and that is our faith and our loved ones. Her message of not focusing on materialistic things really shines through her journey. I highly recommend “Whispers in the Windstorm” by Kathryn Danylko.